Use the Add to Cart button above – For Immediate Download Only $49.95! 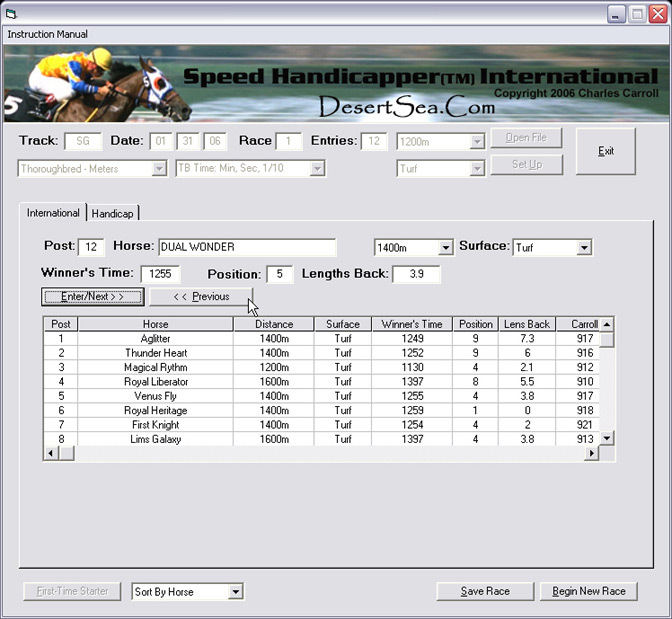 Speed Handicapper® International applies the proven handicapping approach Speed Handicapper®software to international metric distances—as well as North American distances in furlongs for Thoroughbreds and yards for Quarter Horses. 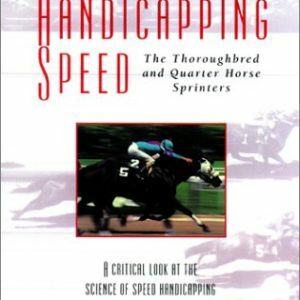 This successful handicapping approach was originally presented in the book Handicapping Speed: The Thoroughbred and Quarter Horse Sprinters, by Charles Carroll, and all Speed Handicapper® software is designed, programmed, and used by Charles Carroll. The program is designed to minimize the time and effort of entering data by using the TAB key to step through the data entry process, and using some “smart” controls to anticipate common entries. 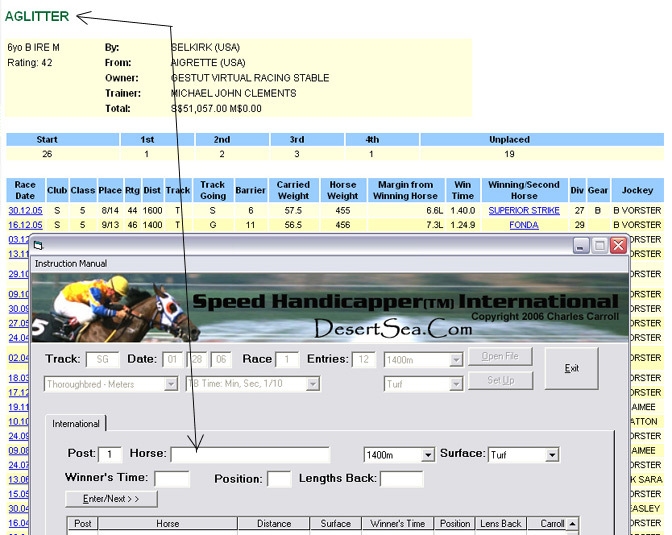 This example shows how to quickly enter and use the past performance data provided by the Singapore Turf Club for handicapping. Next: Enter the basic information for today’s race as shown. Note this new feature! To accommodate the 80+ distances run in Australian racing, you can now type in any distance between 400 and 2500 meters not included in the standard drop-down list. 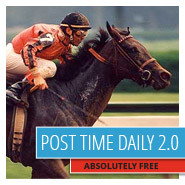 If published times are the actual times for each horse at the finish, check the “Actual Time, This Horse” box. If published times are for the winner only, un-check the box and Speed Handicapper® will calculate the actual finish times for non-winners using the acclaimed Carroll speed method. 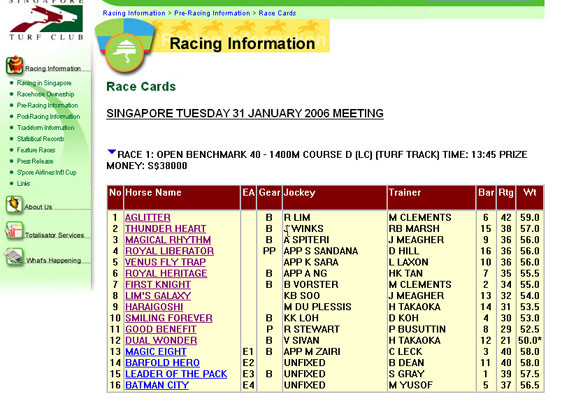 Speed Handicapper® International is shown below running on top of the Singapore Turf Club web site. 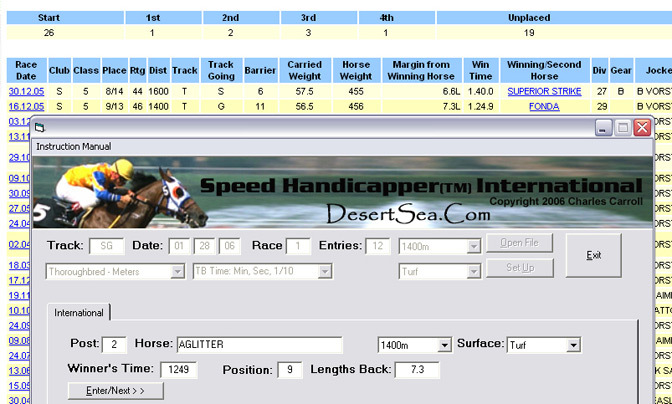 Notice that Speed Handicapper® International can be moved like a ruler to help visually identify the past performance line you wish to use to represent this horse in the upcoming race—in this case its most recent 1400m race to match the current distance. 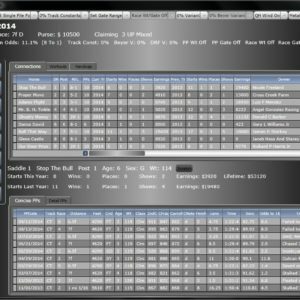 Now enter the selected past performance data for each horse in post position order. If you make a mistake, don’t worry. When all horses have been entered the “Previous” button will appear, allowing you to go back and change any entry you want. Post Position is automatically set as you enter each horse. 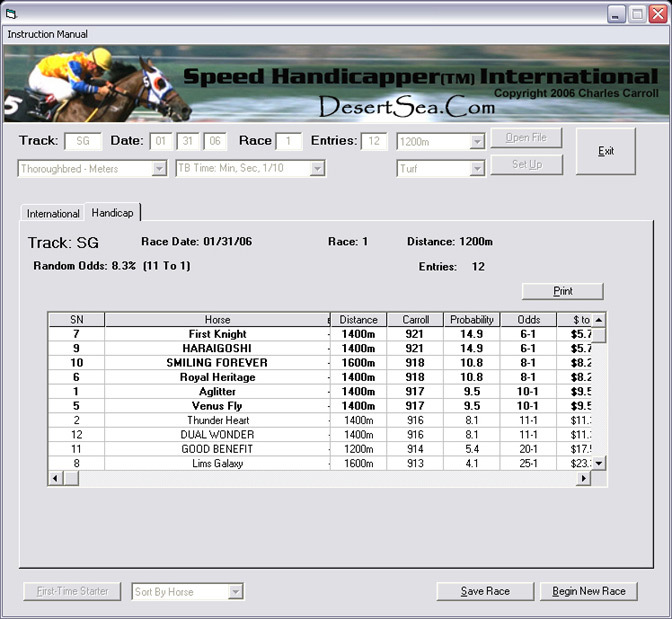 Using the top of the Speed Handicapper® International screen as a guide for your eye, set the distance for this past performance using the drop-down list of distances. Hit TAB to move to the Surface and set the past surface, in this case “Turf,” and hit TAB to move to the winner’s time. Enter the winner’s time of the past race using the keyboard. In this case one minute, twenty-four seconds, and nine tenths. All times are entered without punctuation to save unnecessary keystrokes, in the format shown (msst : minutes, seconds, tenths). Hit TAB to move to “Position” and “Lengths Back” and enter the information as shown. Hit TAB to move to “Enter/Next” and either click on the button or hit Return to calculate speed and complete the first entry. Follow this process for each horse in the race. When the last past performance has been entered, the “Previous” button appears. The “Previous” button allows you to return through the horses for any changes or corrections. The “Handicap” tab also appears. Click it to view your results. To save your work to review later, click the “Save Race” button. The “Handicap” tab presents the results of your work. 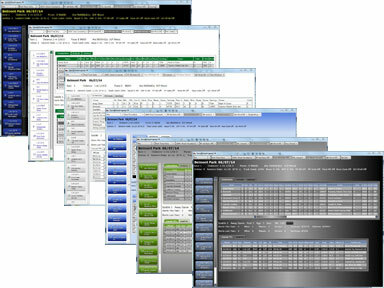 The analysis results can be printed for use at the track or race book, and saved for future study. The projected odds for the contenders are now ready to be used in “value betting” decisions at the track, race book, or on-line.